Another unexpected friendly gesture (besides many others) after my total-loss accident with TW560 came from my neighbor. A car buff (he owns a beetle and an original Jaguar E-Type and drives a luxury version of a Range Rover for his daily commute) he has always been interested in the EV’s and prototypes I’ve been driving during the last 11 years. He even tried a Tesla for a few days … but wasn’t convinced it would be a ‘proper’ car for him. One Friday evening, I spied an i8 in his driveway just across my house and thought: It really looks good in black. I just wish it were a BEV! That would be perfect. I wandered over and saw that it was already plugged in. Checking the charger I immediately thought that the 220V Level 1-brick was rather small – and was right. 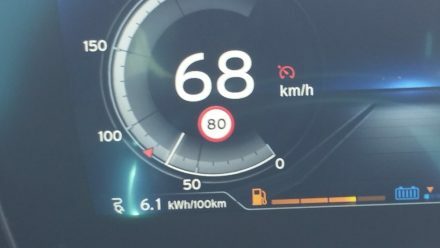 BMW gave this car a whopping 6A!! charger for its 7.1kWh battery – talk about saving money at the wrong place! As my neighbor wasn’t there, I could only guess that the car was there for the weekend for him to test. 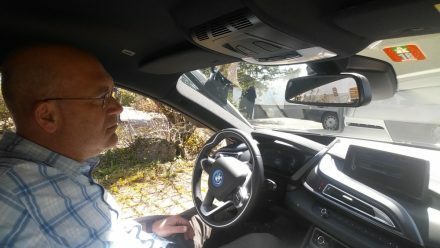 The next day we met outside and he told me that it was heartbreaking to see me without my TWIKE and he wanted to alleviate my pains by offering me to drive the i8 that day – WOW. I get (insert myself, crawl) into the i8 and get ready for a spot of (semi-) electric fun…to be honest: anyone who buys an i8 for its electric range somehow doesn’t get the point of the car anyway. Plus: anyone who knows me is aware of the fact that I love driving fast cars from time to time … electric or not. 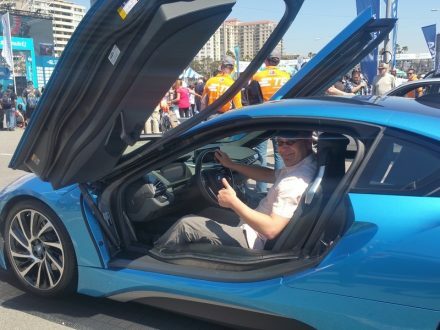 I’m thinking – how cool would an i8 be as a BEV? It’s Caroline’s TW600 that had been brought up to me that day and borrowed to me for 4 weeks – more on the camaraderie and compassion of the TWIKE community in a later entry. 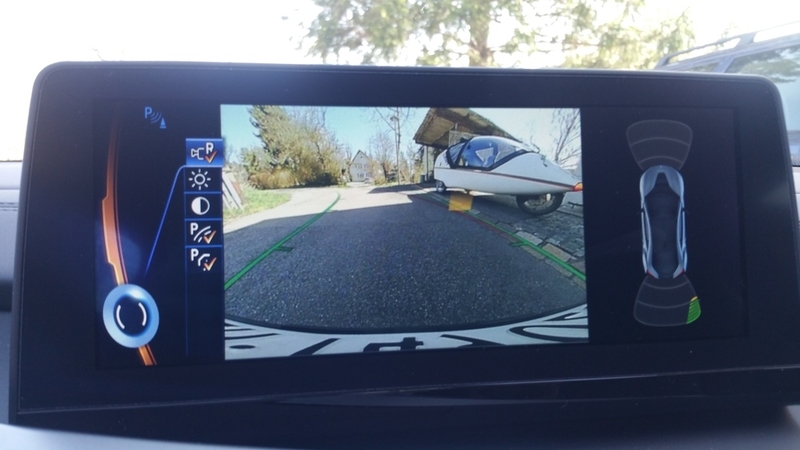 Oh, what’s this in the rear view camera? 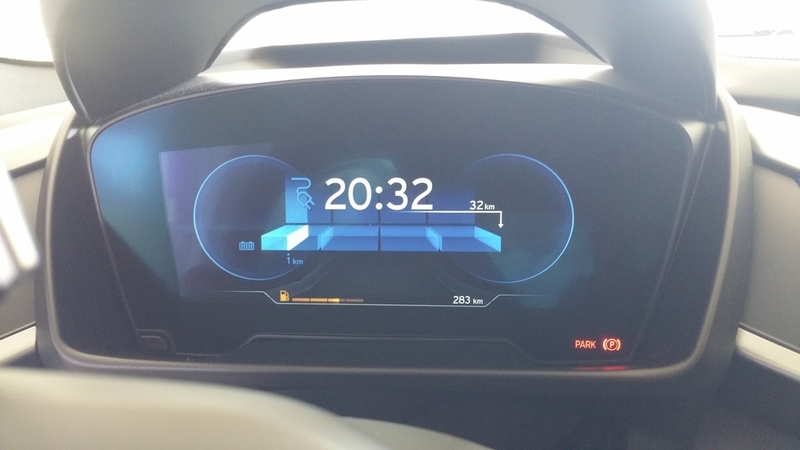 It feels like all good EV engineering went into the i3 (which I like a lot) and the i8 was first designed and then engineers tried to figure out how to fit the parts later on and had to compromise a lot. 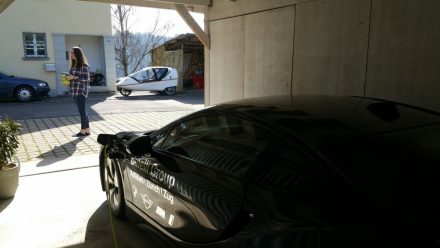 I thoroughly enjoyed my day with the i8 – zipping around corners, swooshing quietly through villages, drawing a small crowd at a charging station in Zürich and all the friendly smiles and thumbs up that I’m used from when I drive my TWIKE. That said, I’m really looking forward to the moment when TW560 is back. Right now, it’s not much more than a pile of junk around a 18,000 CHF battery pack…I truly miss my TWIKE!